Riboflavin, also known as vitamin B2, is a water-soluble, yellow-orange organic compound in the vitamin B complex that is required for a number of metabolic processes in living organisms. While plants and most microorganisms are able to synthesize riboflavin, animals must acquire this essential nutrient in their diet. In most human diets, it is obtained from such common sources as milk, leafy vegetables, whole grains, liver, egg white, cheese, and fresh meat. Riboflavin is an easily absorbed micronutrient with a key role in maintaining health in humans and animals. It is the central component of the cofactors FAD and FMN and is therefore required by all flavoproteins. As such, vitamin B2 is required for a wide variety of cellular processes. Like the other B vitamins, it plays a key role in energy metabolism, and is required for the metabolism of fats, ketone bodies, carbohydrates, and proteins. It is involved in the support of the immune and nervous systems, formation of red blood cells, cell reproduction, and activation of folic acid (vitamin B9) and pyridoxine (vitamin B6). Although needed in only small amounts, riboflavin is essential for proper human function. Its deficiency, known as ariboflavinosis, is associated with a number of conditions, such as cracking of the skin at the corners of the mouth and fissuring of the lips, corneal vascularization and sensitivity of eyes to light, itching and scaling of the facial skin, and so forth. This reflects the intricacy and harmony among the various components of the human body, and between the human body and the outside environment (in the form of food), whereby the complex coordination is broken down due to a dietary deficiency. Vitamins, such as riboflavin, are organic nutrients that are obtained through the diet and are essential in small amounts for normal metabolic reactions in humans. Riboflavin is part of the vitamin B complex, a group of eight, chemically distinct, water-soluble vitamins that were once considered a single vitamin (like vitamin C), but now are seen as a complex of vitamins that have loosely similar properties and generally are found in the same foods. Riboflavin has the chemical formula C17H20N4O6. It is an orange-yellow compound that has a three-ring structure, with two nitrogens in each of two of the rings. It can be quickly broken down by heat and upon exposure to light it is converted to lumiflavin, a compound that destroys vitamin C. Riboflavin's IUPAC name is 7,8-dimethyl-10- ((2R,3R,4S)- 2,3,4,5-tetrahydroxypentyl) benzo[g]pteridine-2,4 (3H,10H)-dione. Its melting point is 290°C. Riboflavin is normally converted in the body to coenzymes, which are organic, non-protein, freely diffusing molecules that are associated with and essential for the activity of enzymes. The name "riboflavin" comes from "ribose" and "flavin." Milk, cheese, leafy green vegetables, liver, kidneys, legumes such as mature soybeans (Brody 1999), yeast, egg white, and whole grains are good sources of vitamin B2. Beef liver is a particular rich source of riboflavin, and milk and dairy products (yogurt, cottage cheese, cheese) also provide substantial amounts. Good plant sources include avocados, spinach and other dark green leafy vegetables, mushrooms, legumes, and nuts (Turner and Frey 2005). Processed grains generally are fortified with riboflavin. Riboflavin is used in baby foods, pastas, sauces, processed cheese, fruit drinks, vitamin-enriched milk products, some energy drinks, and is widely used in vitamin supplements. Riboflavin also is found naturally in asparagus, bananas, okra, chard, meat, and fish. Since exposure to light breaks down riboflavin, diary and grain products should be kept away from light or stored in opaque containers (Turner and Frey 2005). Large quantities of riboflavin are often included in multi-vitamins; often, the dose is far more than a normal human can use in a day. The excess is excreted in the urine, causing the urine to be colored bright yellow within a few hours of ingestion of the vitamin. It is difficult to incorporate riboflavin into many liquid products because it has poor solubility in water. Hence the requirement for riboflavin-5'-phosphate (E101a), a more expensive but more soluble form of riboflavin. Various biotechnological processes have been developed for industrial scale riboflavin biosynthesis using different microorganisms, including filamentous fungi such as Ashbya gossypii, Candida famata, and Candida flaveri as well as the bacteria Corynebacterium ammoniagenes and Bacillus subtilis (Stahmann et al. 2000). The latter organism has been genetically modified to both increase the bacteria's production of riboflavin and to introduce an antibiotic (ampicillin) resistance marker, and is now successfully employed at a commercial scale to produce riboflavin for feed and food fortification purposes. The chemical company BASF has installed a plant in South Korea, which is specialized on riboflavin production using Ashbya gossypii. The concentrations of riboflavin in their modified strain are so high, that the mycelium has a reddish/brownish color and accumulates riboflavin crystals in the vacuoles, which will eventually burst the mycelium. Riboflavin is essential for the production of enzymes for the metabolism of proteins, fats, and carbohydrates into energy. It is integral to cell reproduction, keeping the skin, hair, nails, mucous membranes, and eyes healthy, and supporting the immune system and the nervous system. Both folic acid (vitamin B9) and pyridoxine (vitamin B6) are activated by riboflavin, and riboflavin is used in the formation of healthy erythrocytes (red blood cells) (Turner and Frey 2005). Riboflavin is one of three vitamins known to be involved in the regulation of circadian rhythms in humans and other mammals (Turner and Frey 2005). The Recommended Dietary Allowances (RDA), now converted to Reference Daily Intake (or Recommended Daily Intake) (RDI) ranges from 0.4 milligrams in infants under the age of six months to 1.8 for men from 15 to 18 years of age. Children need 0.5 milligrams from six months to one year of age, 0.8 milligrams at one to three years of age, and 1.2 milligrams at seven to ten years. Women require 1.3 milligrams from 11-50 years, 1.2 milligrams thereafter, and 1.6 milligrams for pregnancy, and 1.7 to 1.8 milligrams when lactating. Men require 1.5 milligrams from 11-14 years of age, 1.7 milligrams from 19-50 years of age, and 1.4 milligrams at 51 and older (Turner and Frey 2005). Riboflavin is not toxic when taken orally, as its low solubility keeps it from being absorbed in dangerous amounts from the gut (Unna and Greslin 1942). Although toxic doses can be administered by injection (Unna and Greslin 1942), any excess at nutritionally relevant doses is excreted in the urine (Zempleni et al. 1996), imparting a bright yellow color when in large quantities. Riboflavin is continuously excreted in the urine of healthy individuals (Brody 1999), making deficiency relatively common when dietary intake is insufficient. However, riboflavin deficiency is always accompanied by deficiency of other vitamins (Brody 1999). A deficiency of riboflavin can be primary—poor vitamin sources in one's daily diet—or secondary, which may be a result of conditions that affect absorption in the intestine, the body not being able to use the vitamin, or an increase in the excretion of the vitamin from the body. In humans, signs and symptoms of riboflavin deficiency, known as ariboflavinosis, include cracked and red lips, inflammation of the lining of mouth and tongue, mouth ulcers, cracks at the corners of the mouth (angular cheilitis), and a sore throat. A deficiency may also cause dry and scaling skin, fluid in the mucous membranes, and iron-deficiency anemia. The eyes may also become bloodshot, itchy, watery and sensitive to bright light. In animals, riboflavin deficiency results in lack of growth, failure to thrive, and eventual death. Experimental riboflavin deficiency in dogs results in growth failure, weakness, ataxia, and inability to stand. The animals collapse, become comatose, and die. During the deficiency state, dermatitis develops together with hair-loss. Other signs include corneal opacity, lenticular cataracts, hemorrhagic adrenals, fatty degeneration of the kidney and liver, and inflammation of the mucus membrane of the gastrointestinal tract. Post-mortem studies in rhesus monkeys fed a riboflavin-deficient diet revealed that about one-third the normal amount of riboflavin was present in the liver, which is the main storage organ for riboflavin in mammals. These overt clinical signs of riboflavin deficiency are rarely seen among inhabitants of the developed countries. However, about 28 million Americans exhibit a common "sub-clinical" stage, characterized by a change in biochemical indices (e.g. reduced plasma erythrocyte glutathione reductase levels). Although the effects of long-term sub-clinical riboflavin deficiency are unknown, in children this deficiency results in reduced growth. Subclinical riboflavin deficiency has also been observed in women taking oral contraceptives, in the elderly, in people with eating disorders, and in disease states such as HIV, inflammatory bowel disease, diabetes, and chronic heart disease. The fact that riboflavin deficiency does not immediately lead to gross clinical manifestations indicates that the systemic levels of this essential vitamin are tightly regulated. A positive diagnostic test for measuring levels of riboflavin in serum is ascertained by measuring erythrocyte levels of glutathione reductase. A deficiency in riboflavin is indicated by changes in the color of the tongue, known as Magenta Tongue. Riboflavin has been used in several clinical and therapeutic situations. For over 30 years, riboflavin supplements have been used as part of the phototherapy treatment of neonatal jaundice. The light used to irradiate the infants breaks down not only the toxin causing the jaundice, but the naturally occurring riboflavin within the infant's blood as well. More recently there has been growing evidence that supplemental riboflavin may be a useful additive along with beta-blockers in the treatment of migraine headaches (Sándor et al. 2000; Turner and Frey 2005). Development is underway to use riboflavin to improve the safety of transfused blood by reducing pathogens found in collected blood. Riboflavin attaches itself to the nucleic acids (DNA and RNA) in cells, and when light is applied, the nucleic acids are broken, effectively killing those cells. The technology has been shown to be effective for inactivating pathogens in all three major blood components: platelets, red blood cells, and plasma. It has been shown to inactivate a broad spectrum of pathogens, including known and emerging viruses, bacteria, and parasites. Because riboflavin is fluorescent under UV light, dilute solutions (0.015-0.025 percent w/w) are often used to detect leaks or to demonstrate coverage in an industrial system such a chemical blend tank or bioreactor. 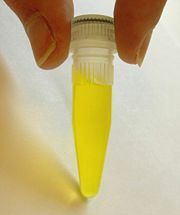 Riboflavin, being yellow or yellow-orange in color, also is used in food coloring. Brody, T. 1999. Nutritional Biochemistry. San Diego: Academic Press. ISBN 0121348369. Sándor, P.S., J. Afra, A. Ambrosini, and J. Schoenen. 2000. Prophylactic treatment of migraine with beta-blockers and riboflavin: differential effects on the intensity dependence of auditory evoked cortical potentials. Headache 40(1): 30-5. Stahmann, K.P., J.L. Revuelta, and H. Seulberger. 2000. Three biotechnical processes using Ashbya gossypii, Candida famata, or Bacillus subtilis compete with chemical riboflavin production Appl Microbiol Biotechnol 53(5): 509–516. Retrieved December 3, 2008. Turner, J., and R.J. Frey. 2005. Riboflavin. In J.L. Longe, The Gale Encyclopedia of Alternative Medicine. Detroit: Thomson Gale. ISBN 0787674249. Unna, K., and J.G. Greslin. 1942. Studies on the toxicity and pharmacology of riboflavin. J Pharmacol Exp Ther 76(1): 75–80. Zempleni, J., J.R. Galloway, and D.B. McCormick. 1996. Pharmacokinetics of orally and intravenously administered riboflavin in healthy humans Am J Clin Nutr 63(1): 54–66. PMID 8604671. Retrieved December 3, 2008. This page was last modified on 10 July 2015, at 21:54.